Gazelle is a suite of tools developed by IHE Europe. Gazelle tools allow testing the interoperability of medical systems as well as the compliance with standards of the messages and documents produced by those systems. 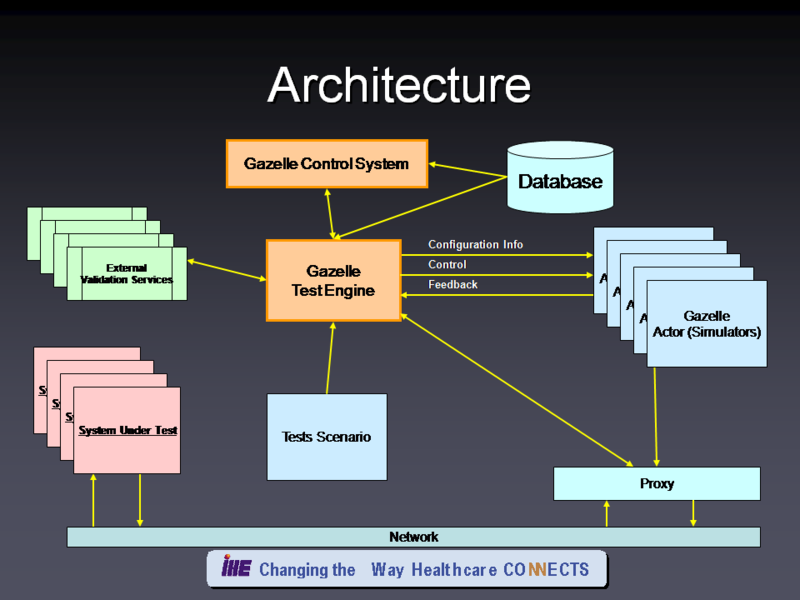 Gazelle also offers a Test Management Solution for testing the interoperability of eHealth software components. The IHE Testing & Tools committee supervises and coordinates the testing activities conducted by National and Regional Deployment Committees and the development of testing software and other tools used in the testing process. The following diagram shows the architecture of the gazelle testbed. Gazelle HL7 Validator This is a web service (SOAP) based application to validate the HL7 messages produced by healthcare IT systems. A graphic user interface is also available to browse the XML conformance profiles (used for validating HL7v2.x messages) and the documentation of the model-based tool used to validate HL7v3 messages. Demographic Data Server (DDS) The Demographic Data Server is a tool used to generate fake patient identities to be used by Gazelle (or others) in the context of testing. The GUI allows the users to select a country and generate patient information valid for that country. The application also provides a web service interface ( wsdl) more... The tools supports generation of data in different locales : names and lastnames in the context of different countries. Addresses with valid zip codes, and finally support of different character sets. External validation services hose services are available as web services (SOAP) and enables the developers and users of healthcare IT systems to check the conformance of the messages and documents exchanged in the context of IHE and other interoperability projects. Test Management this is the test management part of Gazelle. It includes most of the modules developped in the context of Gazelle and presents the main interface the testers uses to test systems. Simulators They are tools which are available all the year long over the Internet. Each simulators emulates the behaviour of one or several actors in the context of specific IHE profiles. It allows your system under test to interact with an implementation of the IHE specifications. Proxy The proxy allows the capture of the messages exchanged by the participants to a test instance. The captured messages are stored in the proxy. The Gazelle Control Module allow the user to associate capture messages with corresponding test instance for message validation in the context of the instance. Gazelle first components were first used during the IHE European 2009 connectathon in Vienna, Austria. At that time, registration, configuration management and results management were handled by Gazelle. The tests selection, running and grading was still performed using Kudu. Gazelle was used again for the 10th European Connectathon in Bordeaux. This was the first time that Gazelle was used to run the connectathon from the registration to the report of results.